The first iPad app from Kayak arrived in March 2010, with the sweet deal of being handpicked by Apple (s AAPL) as one of the few apps to be available at the launch of the original iPad. The only downside? 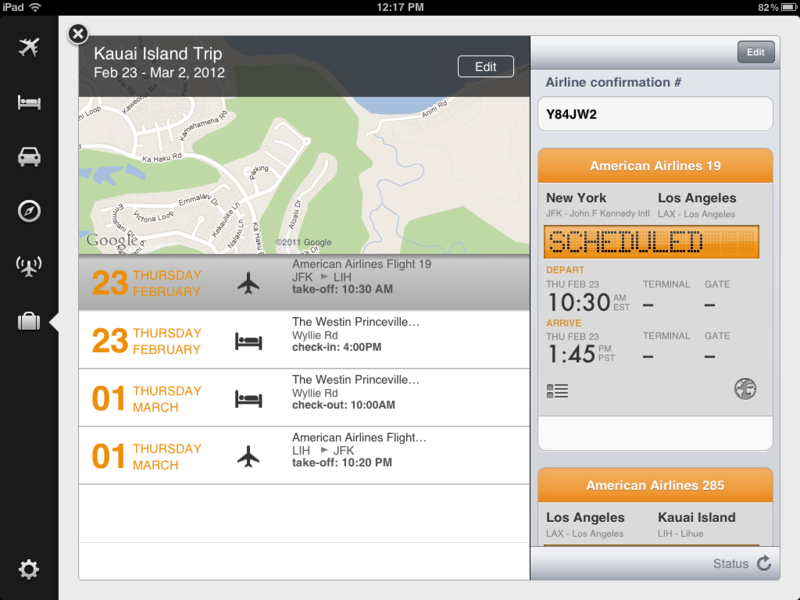 Kayak’s designers had approximately two weeks to get an app together. Oh, and they’d never felt or seen an iPad before. So 22 months later, the team behind the most popular free iPhone travel app think they’ve got it right for the iPad this time. We got a preview of the new app and the overall theme of the changes can most easily be summed up with the word “consistency.” For instance, now the navigation is all left-aligned, with the same icons that will be familiar to users of previous versions of the app. 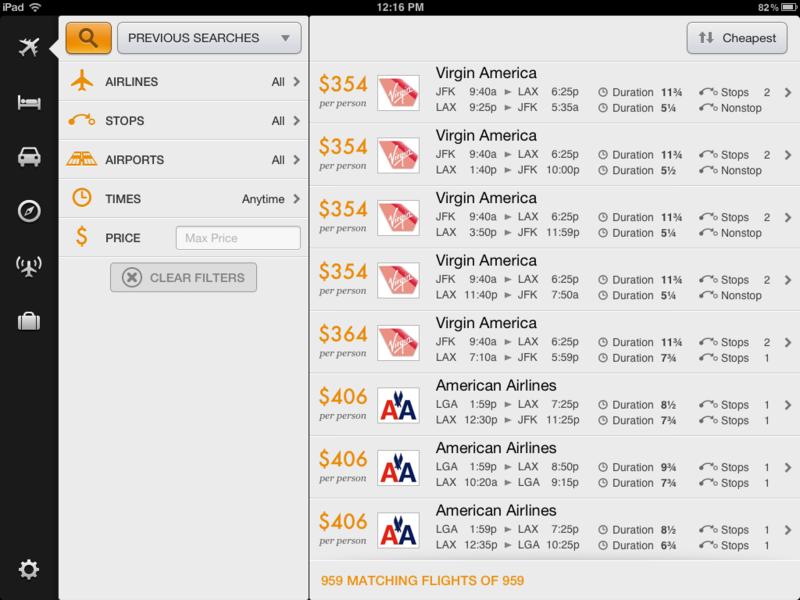 All the filters for searches (flight, cars, hotels) are on the left and the results on the right. The designers in Kayak’s mobile development lab in Concord, Mass. spent a lot of time “nitpicking” and making the design language universal for the brand, said Bill O’Donnell, Kayak’s GM of mobile and chief architect. “With this new release, we wanted to bring it up to modern iPad app standards and our own modern visual look we have in our iOS applications,” he said in an interview Tuesday. And making the way the app is navigated and making all the functions consistent (the UIs for flight and hotel search were different in the previous app) was a huge priority. They also added in some features that have been on the Kayak website and in the iPhone app to this new universal iOS version, like rental car search and the Kayak Explorer (a favorite of those of us with wanderlust), an expanded trips management feature that allows you to send any reservation confirmation emails to the app, including concerts and restaurant reservations, and an auto form filler optimized for tons of travel sites Kayak works with. Another major lesson learned is the implementation of direct booking of hotels. There’s a big impediment to being a an aggregator of travel deals when you’re working with mobile users: When you direct those customers to outside airline or hotel websites, you never know what exactly you’re sending them into. Kayak introduced direct bookings for some hotels and flights a few months ago, but this is the first time it’s coming to the iPad app. So what has the iPad team been doing these past two years? Since the 2010 iPad launch, Kayak has had a lot to figure out about the space — as in what users want, and what other developers are doing that’s cool and innovative — and learning to evolve with the maker of the iPad and arbiter of iOS app taste and style, Apple itself. “We had to learn all that. There’s no way around that except time and experience,” O’Donnell said. It was also a challenge to figure out the difference between designing for a tiny iPhone screen, a much larger computer browser and an iPad screen. It takes far more time to design well for the iPad, according to O’Donnell. There’s also something in here for users of Kayak’s iOS apps to learn: The new app, as mentioned before, is universal. So if you have the old iPad HD app, that one’s dead now and won’t be updated again. The new iOS app, which is still free, will have to be downloaded anew. It will detect if you’re downloading it on an iPhone or an iPad. It should be in the App Store later today. I have to agree that the whole affiliate refferal system is pants, sending thousands of users to hostelbookers for zero money made us mad as hell. We wonder if they were doing this across the board or if it was a technical error though we went over the strings with a fine tooth comb. Obviously we know they are not purposefully doing this but disappointing was a young employee who would not escalate this issue and blocked our advance in building a relationship. So we are now building our own relationships with hoteliers and hostels it will be a smaller niche market more for work but at least we don’t need to be reliant to a system that seems to have bugs that the company who think they have it all sown up isn’t interested to fix. I just found the app in the app store under “kayak pro” and showing today’s release date. But it’s not free, as your article states, it’s .99. Not that it’s a big deal. you can also find it the free section where it is just listed as KAYAK.